So I’m off to Ghana (in West Africa) for work, which will make a very welcome change to flying to Sydney. 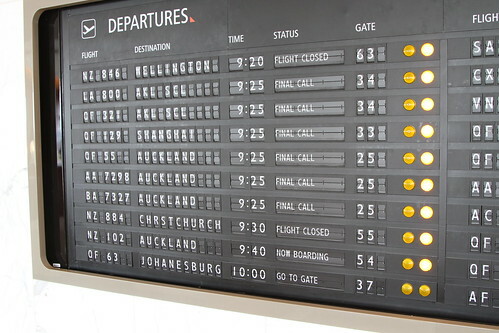 However, I’ve found out that flying to Ghana is a colossal pain, involving a number of unfortunately timed flights. People who say it’s about the journey, rather than the destination, obviously haven’t spent 28 hours in economy. 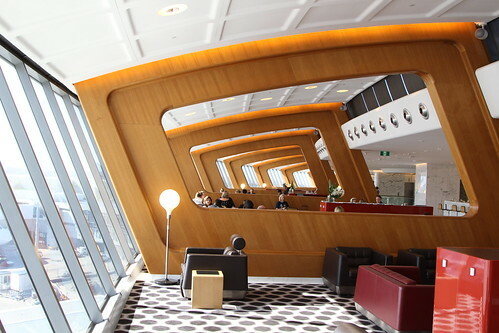 It’s not all bad news though – the one thing that I was excited about was the Sydney First Class Lounge. If you catch a mere 60 return flights to Sydney in a calendar year, they let you in. You can decide whether it’s worth the sacrifice. Forget the buffet queue of the normal lounge, or the middle managers smashing crownies. This is fancy. 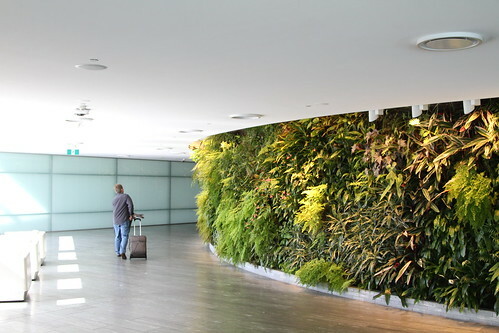 You walk in past a very impressive planet wall and then you catch an escalator up to the lounge, which through its curved windows, has expansive views of the airport and the city. Just to reinforce the appropriate social hierarchy, it’s situated on top of the standard lounge. You can either sit down in the dining area or in one of the imposing armchairs looking out onto the airport, so you can feel like a mini Alan Joyce. And then you’re given a menu, and you can go absolutely nuts. 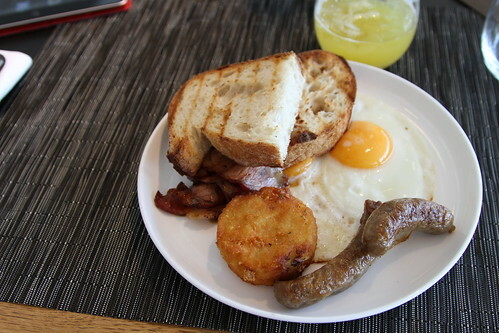 I ordered my customary two fried eggs, with a side of bacon, hash browns and pork chipolata. All washed down with some freshly juiced pineapple juice. It was glorious. The bacon was lean and cooked perfectly, and the chipolata’s weren’t very oily. The bread was the only letdown, it was a little thick, but I’m sure you could just ask them to cut it thinner. I wouldn’t be complaining if this had been served up in the latest hipster approved four-table cafe we visited in Richmond. This is without a doubt the fanciest lounge I’ve been to. If you’re not indulging in some pre flight gluttony, you can enjoy a massage at the day spa, or just enjoy the unobstructed view of the airport. Every other lounge is now ruined for me. This entry was posted in Eating in-flight, Eating out. Bookmark the permalink. Trackbacks are closed, but you can post a comment. On the basis of the blog we ventured all the way from Warrandyte to Phat Brats for lunch. Not disappointed and well worth the 56 kilometres round trip. We thoroughly recommend the pork and sage brat. Chips were yum!